This dependable waterer provides a limitless supply of clean water for baby chicks and turkey poults through the broiler period. Extra-shallow bowl helps reduce the risk of baby birds drowning. Everything you need is included to hook up to any standard half- inch NPT pipe. 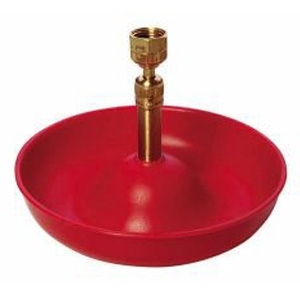 Heavy-duty plastic bowl with non-rusting brass fountain stem. Valve safely operates between 20 and 50 psi. Holds 1.5 pints of water and waters up to 200 baby chicks. Bowl measures 7.25 inch in diameter and 1.75 inch deep.